*UPDATE* Read a write-up of the meeting on the Living Data Research Group website. Many thanks to Richard Tutton, Mairi Levitt and Garrath Williams at the Department of Sociology and Centre for Science Studies for organising the event, and to Maggie Mort for chairing such a lively public discussion. 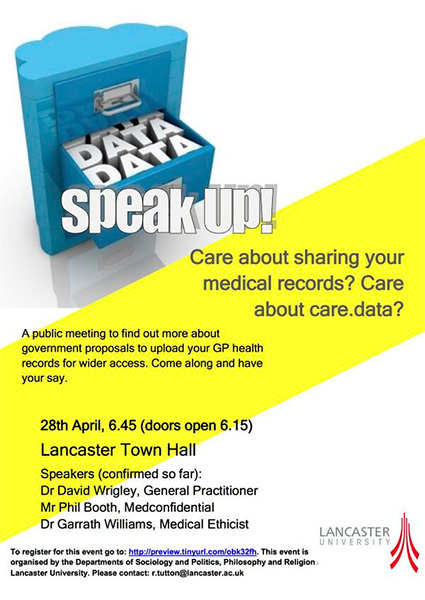 SPEAKERS: Dr David Wrigley, GP based in Carnforth; Phil Booth, medConfidential, Dr Garrath Williams, Senior Lecturer, Lancaster University, others tbc. This entry was posted in Events on April 6, 2014 by Phil.